Update 2018: This article (and video) makes mention of this train being only open between Urumqi to Hami. 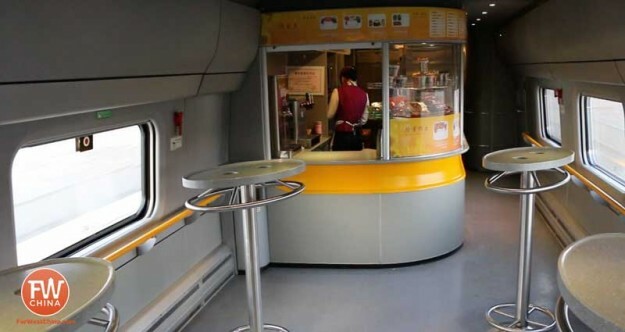 However, currently this train is now completely open from Urumqi to Lanzhou in Gansu. Sitting here in this comfortable high-speed train watching the Xinjiang countryside whiz by forces me to remember the first time I stepped foot in this incredible region. 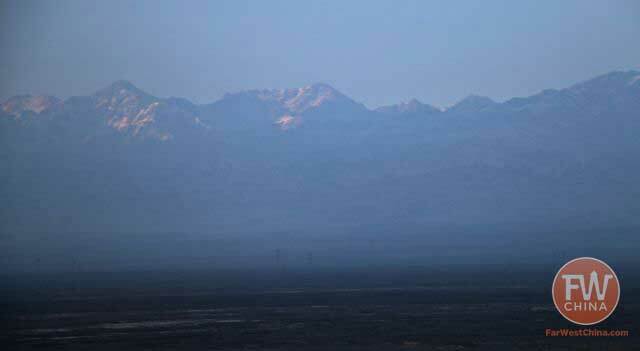 I remember the majestic snow-capped TianShan presiding over the vast swaths of farmland. I remember seeing herds of sheep and camels out the window. 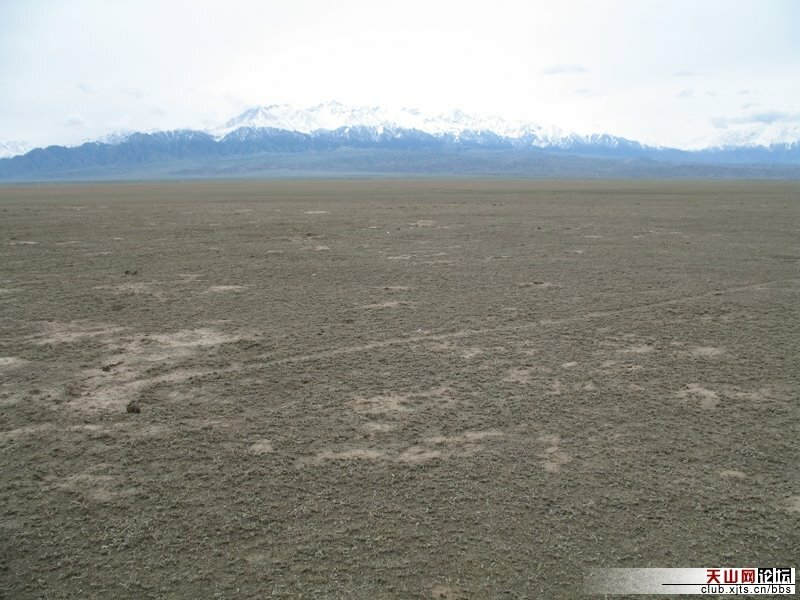 I remember feeling like Xinjiang’s desert wasteland extended on forever. I also remember being cramped in a small car that felt like it was going to fall apart at speeds exceeding 60km/hr. Today, I’m cruising in a beautiful new high-speed train that glides smoothly along Xinjiang’s desert at 200km/hr. 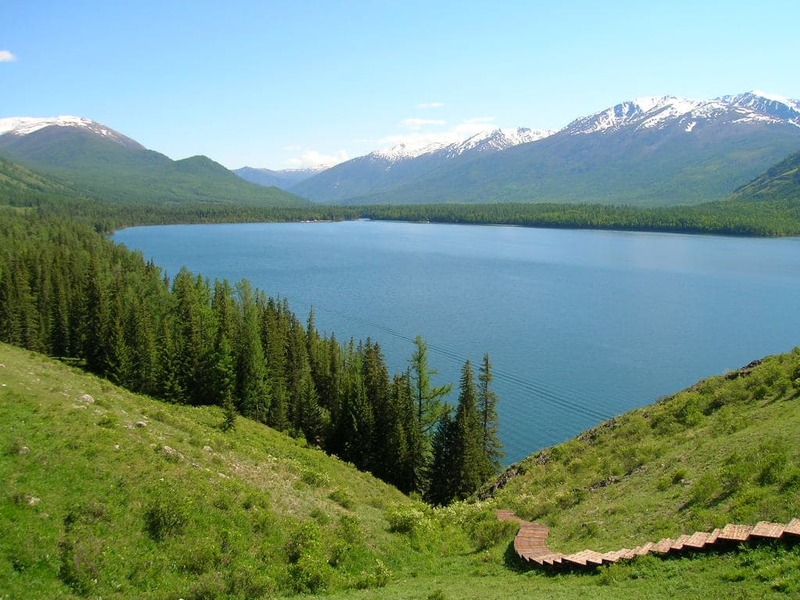 The views of Xinjiang are essentially the same, but the window through which I see them has changed. 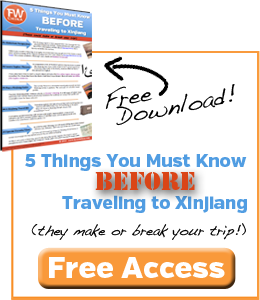 Don’t miss any more Xinjiang videos! Subscribe to FarWestChina on Youtube! Back in January of 2010, when construction of the LanXin high speed rail line officially began, five years seemed like an eternity away. Truthfully, I didn’t think I was going to be around here long enough to see it completed. Just a month earlier in 2009 I had met my family in Shanghai and subjected them to a grueling 46 hours in a train to Urumqi. Although I don’t think any of us regret the trip, I doubt it’s one we would willingly take again. The idea that a high speed train could cut that time down to less than 20 hours seemed like a pipe dream at the time. Progress marches on, though, and on October 16, 2014 Xinjiang officially entered the era of high-speed rail transport. I bought my first ticket to ride less than two weeks later. The train I’m riding right now is part of what’s known in China as the “Lan-Xin” rail (兰新高铁), which is shorthand for saying “Lanzhou to Xinjiang” railway. When fully operational, the line will span from southern Gansu province, through Qinghai and into Xinjiang. 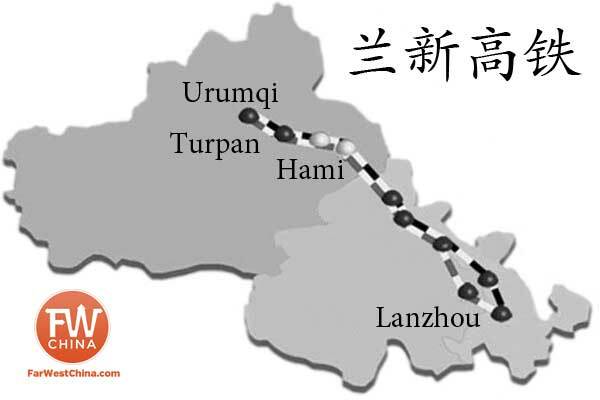 Between Lanzhou and Urumqi there are only 8 stops which include some great tourist spots like Dunhuang, Hami and Turpan. Currently, they’ve only opened the line up between Urumqi and Hami, although officials promise to have the entire line running within a few months. Engineers had to overcome quite a few technical challenges during the construction of this rail line. Most importantly, they had to figure out how to safely navigate a high speed train through famously windy sections of Xinjiang desert without toppling over, something which had tragically happened before. Due to these concerns and others, large wind barriers and tunnels were erected all along the route and thanks to security concerns a large barbed wire fence guards both sides of the entire line. All that to say, the view outside my window – while beautiful – is often obstructed. New train stations were built to accommodate the high speed train in Turpan, Dunhuang and Hami (which unfortunately burned just months before opening), which also includes a beautiful new Urumqi train station. 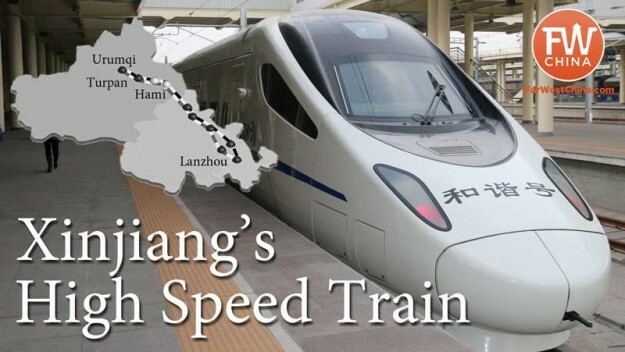 What really excites me about this high speed train, however, is how it will affect travel along the Silk Road in Xinjiang. Turpan, once a 3 hour bus ride from the capital of Urumqi, is now an easy day trip. I took the 9am train which arrived in Turpan within an hour. I had the full day to explore before getting on a return train at 10:30pm. Considering tickets are about the same price as a bus, taking the high-speed train is a no-brainer. Buying tickets really isn’t that difficult either. While it’s entirely possible to purchase China train tickets online (which is what I did), you need to be able to read Mandarin and have a China bank account with which to pay. A simple alternative is to either purchase at the station or pay a little extra for a travel company to buy the tickets and deliver them to your hotel. Although many budget travelers may squirm at the idea of paying an extra fee for someone to buy your tickets, just remember that Xinjiang is not Beijing. We don’t have “English-speaking” ticket windows and nobody cares that you’re a foreigner. It took me, a seasoned Xinjiang traveler, over an hour to navigate the buying/will call process. The hours you save in hassle could be well-worth the extra fee. However you purchase your tickets, be prepared for airport-like security when you enter the Urumqi train station, thanks in part to recent events. I had to walk through no less than three metal detectors, X-ray machines, pat downs and ID checks. Oh, and that cool Uyghur pocket knife you just bought at the bazaar? Don’t expect that to make it through. Sorry. 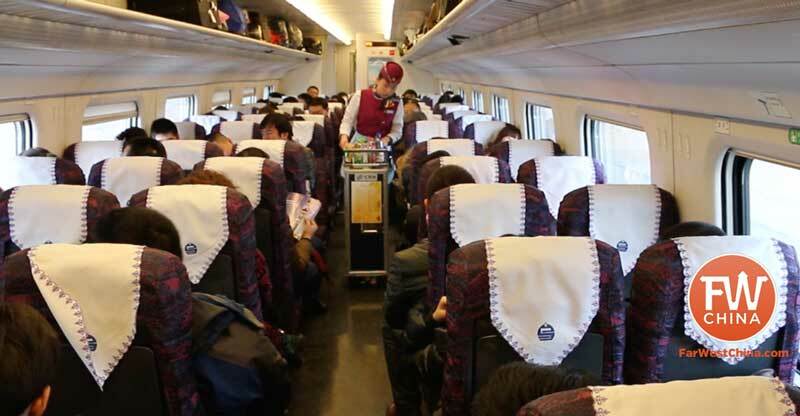 There are currently two class options available on Xinjiang’s high-speed train: first class and second class. Of the 8 cars which make up each high-speed train, there is one first class car, six second class cars and a single restaurant car. First class seats are two to a side with plenty of legroom. Second class seats are a 3-2 setup which is a bit tighter but still comfortable. The rail car has no seating but it’s a nice place to stretch the legs! I was hoping that there would be power outlets in first class but alas, they’re only found in the bathroom. Cell coverage has been terrible the entire trip which means I haven’t been able to make any calls or check email. I’m grateful, however, that leg room is spacious, which says a lot coming from a 6’2″ (1.8m) guy. 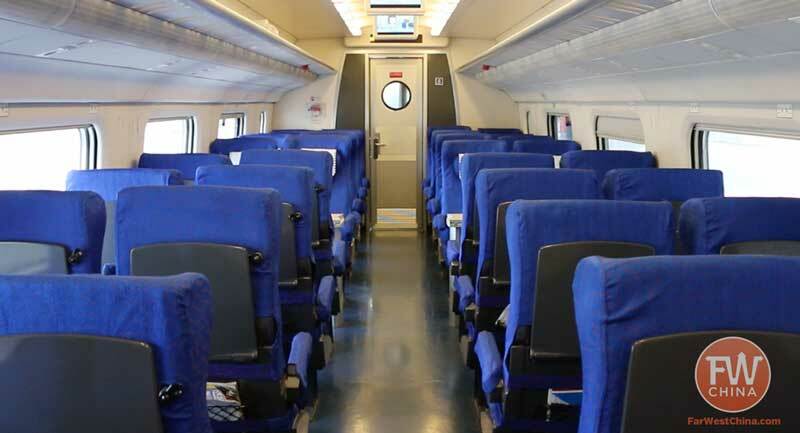 If you’re traveling in a group of three or more, there are some seats which face each other that would allow for great conversation and games. 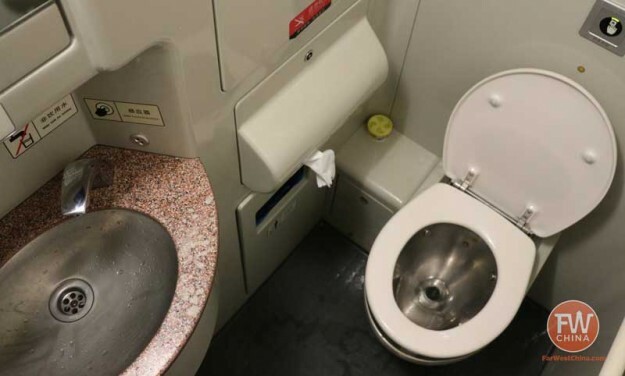 Finally – and this is huge – the first class car has a toilet that meets western standards, meaning it is both clean (for now) and it has an actual seated toilet. This is different than what you might normally expect with bathrooms in China. It truly is a comfortable ride, particularly for those of us who have lived here in Xinjiang for a while and aren’t used to these kinds of luxuries. I can now see NanShan through the south facing windows of the train, which means that I’m reaching the end of my trip back home to Urumqi. Soon I’ll be jumping into a Urumqi taxi which more than likely won’t be such a peaceful and picturesque ride. Nor will I be traveling at 200km/hr. No doubt I’ll be boarding this train again soon, if for no other reason than to give my young son the pleasure of his first ride. I know he’s going to love it. Thanks for sharing this news. I love China especially on western region lie Xinjiang. I travelled to Qinghai and Gansu, Ningxia in 2013 and I’m very impressed with the desert scenery from Xining to Lanzhou when travelling by slow train. I think I love slower train to just sit and relax to watch the desert scenery picturesque unfolded to me. As foreigner come to China many times for business trip, I see an exceptional view of good industry undoubtably confirmed, I wish only to pass my high recommend of such a service. China again and again surpasses our west in all manner of innovation. I found your website really useful especially since I’m going to Xinjiang. I have a question, I’ll be travelling to Urumqi from Xi’an in the middle of January next year. Will it be hard to get a train ticket during this time? Is it possible to get a sleeper berth (I don’t mind hard sleeper) 2 days before departure? I only have 3 weeks in China so waiting around for another week won’t be much of an option. Thanks in advance! Hi Vera! Thanks for your comment. Middle of January shouldn’t be terribly hard to get tickets, although hard sleeper berths are certainly the quickest to sell out. If I were you I would recommend buying your train tickets now if you can (for reference, here’s how to buy China train tickets online). It’s a risk buying two days before departure. My guess would be that January won’t be crazy yet, but you never know. Supposedly this line opened in December of last year, but I can’t find it when I look for trains between Beijing and Urumqi on the Chinese booking website, chinahighlights.com, or anywhere. All that comes up is the 40 hour train that existed before. Is it not yet fully operational? I’m competing in the Gobi March at the end of May. I arrive into Urumqi on the 29th May morning and need to get to Hami by that evening. The event organisers are charging US $160 for a bus and I know a train must be cheaper …..they tell me it is too difficult and unreliable to get a ticket. As you suggested can I get a ticket delivered to a hotel in Beijing the day before ? ?….I could try and book through an agent in Melbourne . Hey Cathy! Wow…US$160 is a RIPOFF. Do the 1st class coaches in the High speed train on the Lanxing trains have space to hold a full size suitcase. Is there a luggage storing place like you have on the European trains at the entrance of the coach?